Next Tuesday, February 14th, is Valentine’s Day. DO. NOT. BLOW IT. Back in high school, performance on Valentine’s Day was everything. Giant teddy bear? Check. Heart shaped balloons and bouquets of carnations? Check, check. Brian McKnight/ KC and JoJo mix tapes and folded loves notes shoved through the vent of your locker? Might as well be the boyfriend starter kit. Once you get to college, things escalate a bit. Dinner dates, rose bouquets, and jewelry are the new gifting norms, although, if you can land a guy who opts for concert tickets and cooking classes, YOU ARE WINNING AT EVERYTHING. Unfortunately, after college and into adulthood, Valentine’s Day loses a bit of its luster. Babysitters are impossible to book, restaurants are too crowded, and somehow, husbands think items like dustbusters and shower curtain liners qualify as legitimate gift options (they don’t, BTW). It’s no wonder that people get fed up with Valentine’s Day. What’s there to love about overpriced retail gimmicks and packing into movie theaters with a bunch of hormonal, sweaty-palmed middle schoolers whose moms think they’re watching the newest Pixar film with their “friends” (they’re not, BTW). Guys, I’m going to break it down for you as plainly as I can. Please, let me make it simple for you. Are you ready? EVERY GIRL LIKES VALENTINE’S DAY. You know what we want? We want chocolate. And not just any average heart-shaped, store bought, golden box of chocolates. We want delicious, melt in your mouth homemade chocolates, made by the sweat of your brow and at the expense of your time spent with a remote in your hand. 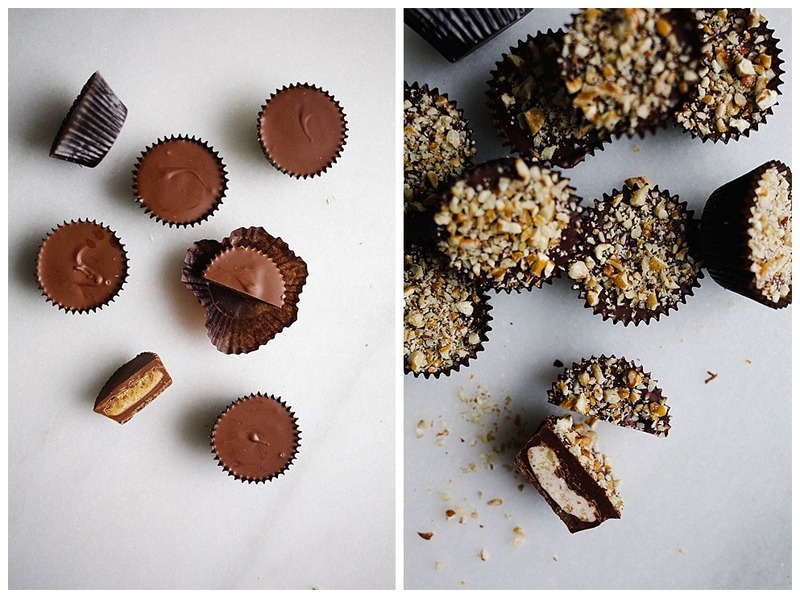 Specifically, we want these bourbon pecan, peanut butter cup, and coconut almond chocolates. There. Now you know. So let’s get to it. These homemade chocolates are no bake and are made with just a few basic store bought ingredients. 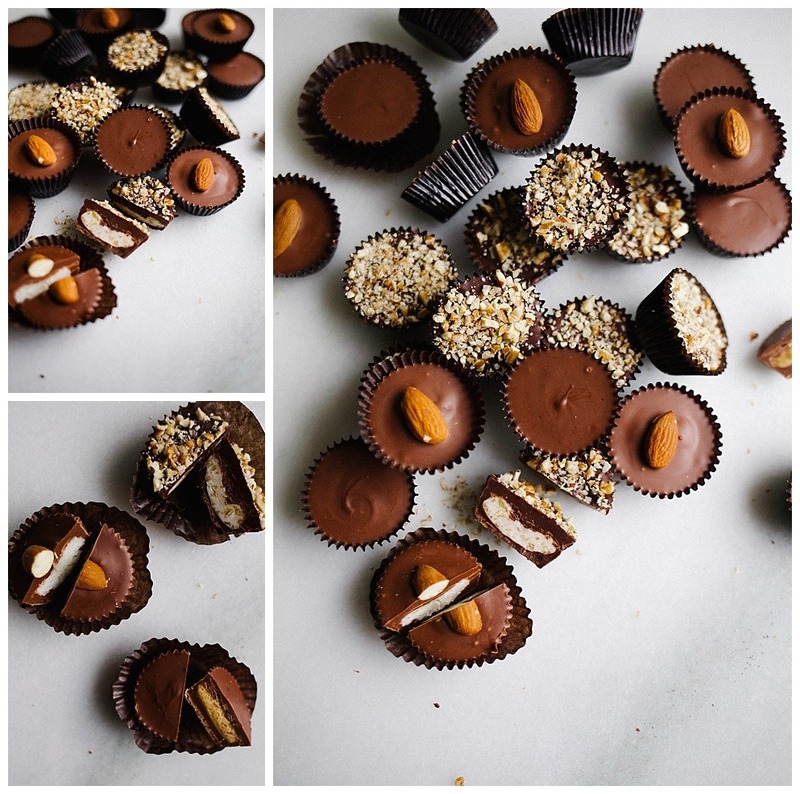 I decided to include a few variations of homemade chocolates so that there’s an option for almost everyone, but primarily so that the overachiever boyfriends can impress their ladies with an assortment of all three. But girls, don’t be afraid to get in there and make these for your man too! If he’s got a sweet tooth like mine does, just a few of these beauties will go a long way and he will be grateful you passed on the conversation hearts and sappy card. First up is bourbon pecan. If you’ve ever had the Southern treat of “Bourbon Balls,” you can expect something quite similar here. With a dark chocolate shell, these little bourbon pecan homemade chocolates are filled with powdered sugar, toasted pecans, and premium booze. These are perfect for the bourbon lover in your life, or someone who loves their desserts extra dark and extra sweet. 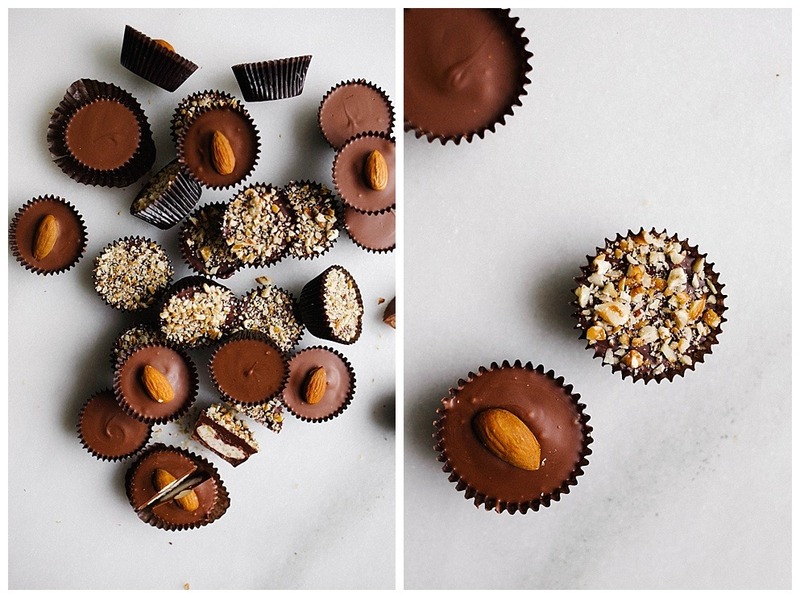 Peanut butter cups take homemade chocolates to the next level. Everyone loves the store-bought variety of peanut butter cups, but have you ever had one literally melt upon impact with your mouth? Prepare for that here. These peanut butter cups are RICH, filled with a fluffy peanut butter cream filling and coated with smooth milk chocolate. A crowd favorite, if you’re ever in doubt, just go in this direction. 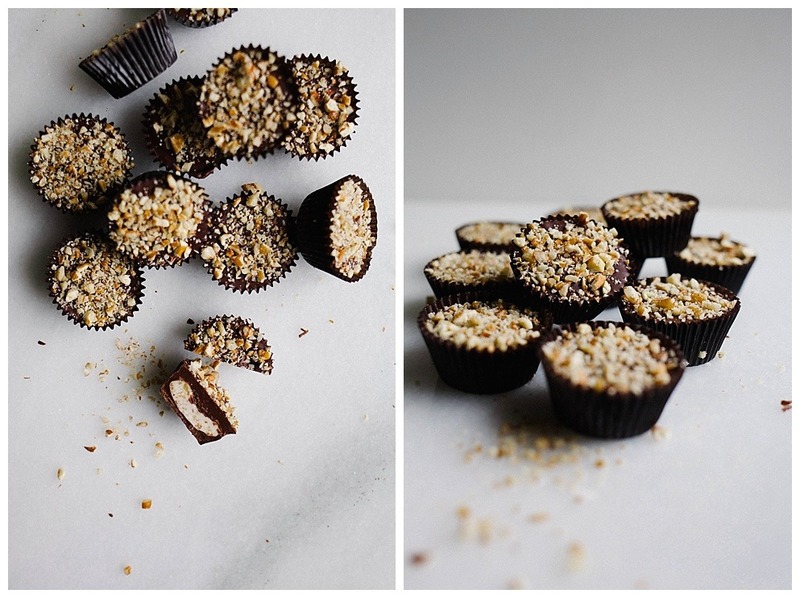 Finally, my favorite of these homemade chocolates, the coconut almond chocolate. Filled with sweetened coconut and a little extra sugar, these little friends are coated in a milk chocolate blend and topped with a single toasted almond. Anyone who knows anything about candy will know what a treat they’re in for when they spy these little friends. For a nut-free option, leave off the almond and top with a few flakes of toasted coconut or a sprinkle of sea salt. Perfection! 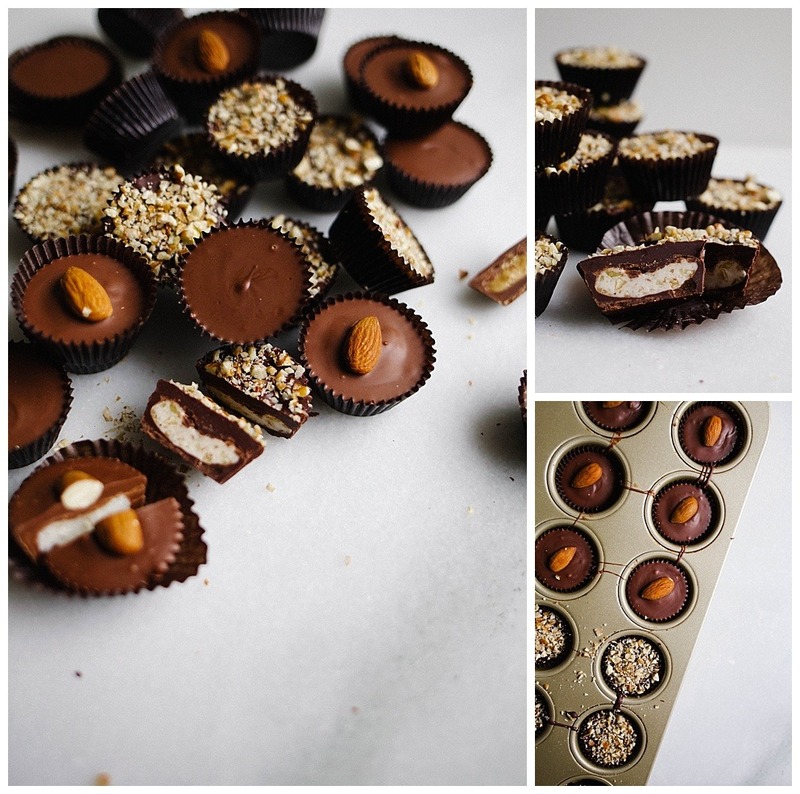 These homemade chocolates require some special equipment like a mini muffin tin and little waxed paper cups for the candies, but the assembly is quite simple. In a pinch, you can used paper mini muffin liners, although, beware that some stickage can happen. And if you’re not a fan of dark or milk chocolate, feel free to swap up the top used in the recipes! I like each chocolate as the recipe is written, but certainly you can switch it up if desired. Any man friend that takes the time to muster these up for his lady is worth his weight in gold chocolate and has certainly outdone himself on Valentine’s Day. 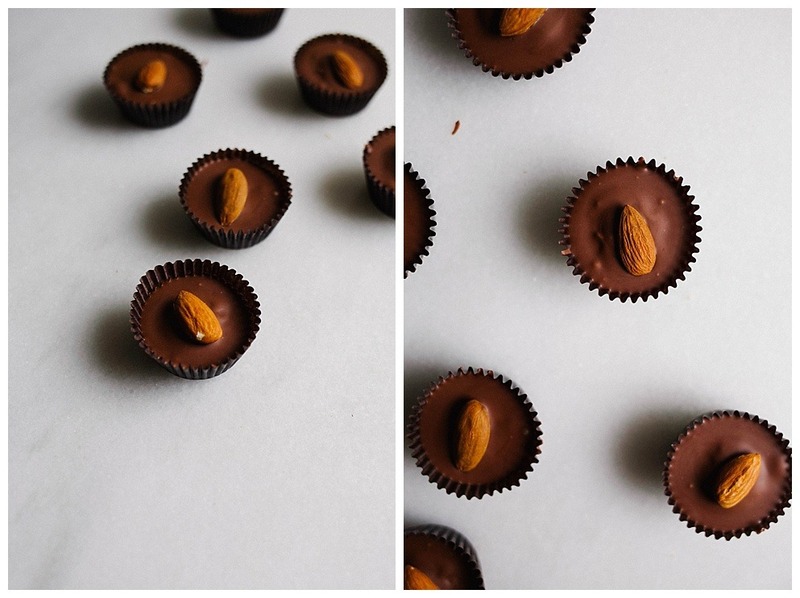 You should give these homemade chocolates a try for your significant other, friends, co-workers, or secret admirer- they’re sure to overflow with heart eyes and appreciation. Ladies, if you’re reading this thinking, “Yes! I want my man friend to make me homemade chocolates,” just do like I do and copy the link to this post in an email to him. Yes, I know, it’s not too subtle, but if you ask me, you can’t ever be too obvious. On the off chance that your special someone doesn’t like chocolate, let me encourage you to just let them know they’re loved in a special way. You probably already know what types of things make their heart skip a beat, so I’d challenge you to go the extra mile to make someone feel like a million bucks next Tuesday. Happy weekend, Happy Valentine’s Day, Happy #monthofchocolate, and as always, cheers to you! 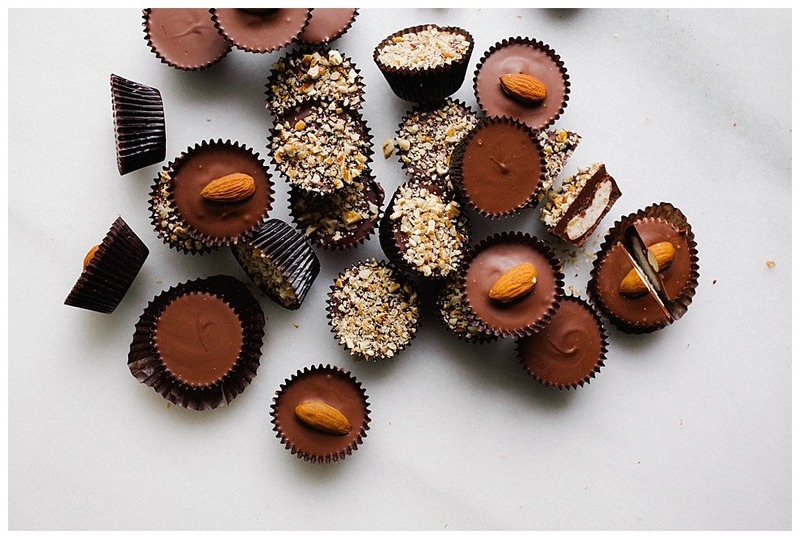 These homemade chocolates includes peanut butter cups, bourbon pecan candy balls, and coconut almond candies. No bake, easy to assemble, simple gift option! In a double boiler or heat proof bowl set over a pot of simmering water on medium-low heat, melt the chocolate chips and shortening together. Stir frequently to ensure that the chocolate does not get too hot. If you allow the chocolate to become too hot, it could seize up, so be sure to keep the water on medium-low heat. Once melted, set off to the side while you prepare your filling. In the meantime, cream together the butter, powdered sugar, and bourbon in a medium sized bowl. Once fluffy and smooth, stir in ¼ cup of pecans. Set in the fridge to chill briefly. Line a mini muffin pan with waxed paper candy cups. Fill a plastic sandwich bag (or a piping bag fitted with a small round tip) with approximately half of the melted chocolate and snip the tip of it off, being sure to not cut too large of a hole or allow all of the chocolate to drip out immediately. 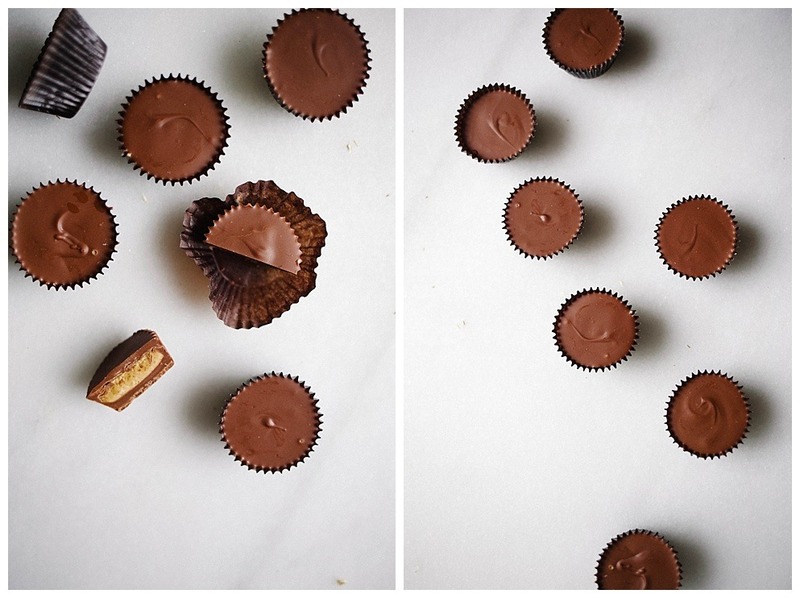 Squeeze 1 teaspoon of chocolate in to the bottom of each of the paper candy cups and then set the plastic bag aside. Use a small instrument (I use a small clean paint brush or the end of a chopstick) to paint the chocolate up the sides of the paper candy cup, coating up at least half of the height of the paper. This prevents the filling from showing out the sides of the chocolate once the candies are assembled. If you don’t care if the filling shows, you can skip this step. Once covered, place the pan in the fridge or freezer to chill for about 5 minutes. Once firmed up, scoop teaspoon sized rounds of the bourbon pecan filling into the bottom of each cup. You can lightly wet your finger and gently smooth out the top of the filling to make a flatter mound. Add more chocolate to your plastic bag and then top the filling with an additional teaspoon of chocolate. Use your paint brush to smooth out the chocolate and cover the filling completely, and then gently rap your pan on the counter to smooth and settle all three layers of the candy. Sprinkle the tops with the remaining pecans. Allow them to rest in the mini muffin tin in the fridge or freezer for at least 30 minutes. Store candies in the fridge for up to two weeks. The candies may form a white film on the chocolate if stored at room temperature for extended periods of time. In the meantime, cream together the peanut butter and butter in a medium sized bowl. Add the salt and powdered sugar and continue to beat until smooth and fluffy. Set in the fridge to chill briefly. Line a mini muffin pan with waxed paper candy cups. Fill a plastic sandwich bag (or a piping bag fitted with a small round tip) with approximately half of the melted chocolate and snip the tip of it off, being sure to not cut too large of a hole or allow all of the chocolate to drip out immediately. Squeeze 1 teaspoon of chocolate in to the bottom of each of the 24 paper candy cups and then set the plastic bag aside. Use a small instrument (I use a small clean paint brush or the end of a chopstick) to paint the chocolate up the sides of the paper candy cup, coating up at least half of the height of the paper. This prevents the filling from showing out the sides of the chocolate once the candies are assembled. If you don’t care if the filling shows, you can skip this step. Once covered, place the pan in the fridge or freezer to chill for about 5 minutes. 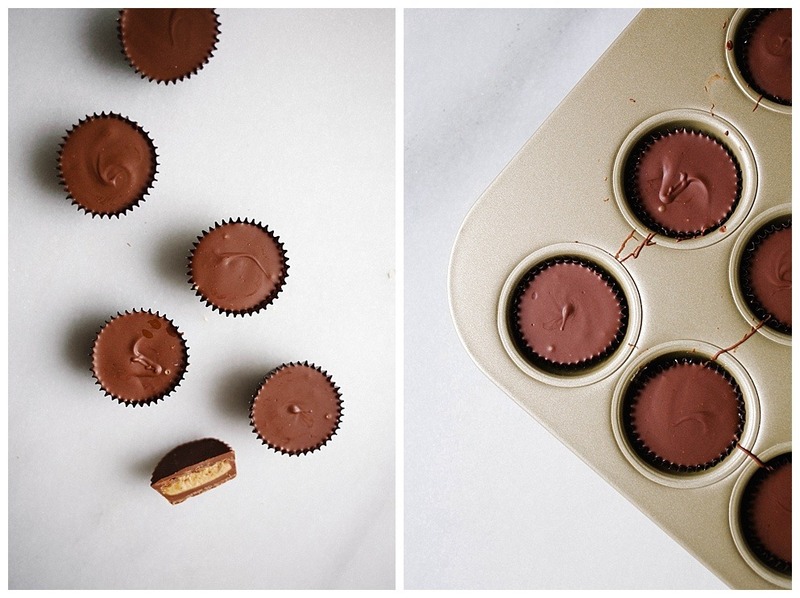 Once firmed up, scoop teaspoon sized rounds of the peanut butter filling into the bottom of each cup. You can lightly wet your finger and gently smooth out the top of the peanut butter to make a flatter mound of filling. Add more chocolate to your plastic bag and then top each peanut butter mound with an additional teaspoon of chocolate. 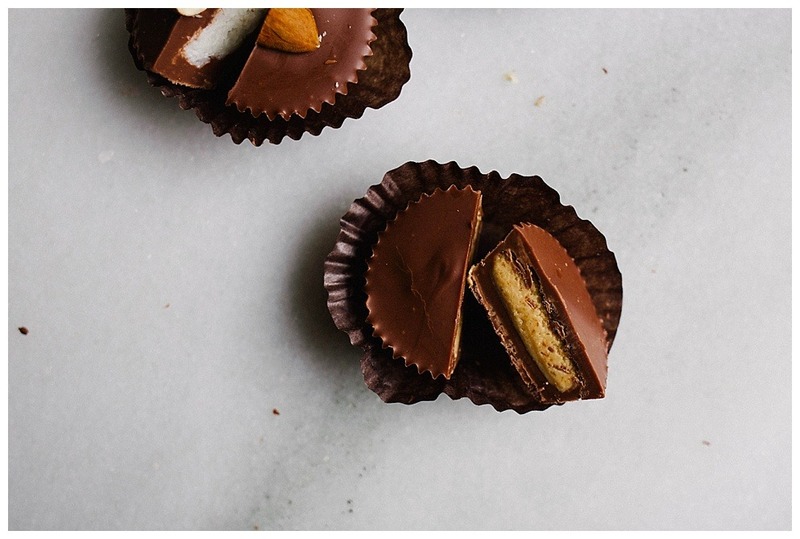 Use your paint brush to smooth out the chocolate and cover the peanut butter completely, and then gently rap your pan on the counter to smooth and settle all three layers of the candy. Allow them to rest in the mini muffin tin in the fridge or freezer for at least 30 minutes. Store candies in the fridge for up to two weeks. The candies may form a white film on the chocolate if stored at room temperature for extended periods of time. In the meantime, beat together the butter, coconut, corn syrup, and powdered sugar in a medium sized bowl. If you wish for a smoother, less clumpy filling, feel free to whiz the mixture in a food chopped briefly. Set the filling in the fridge to chill briefly. Once firmed up, scoop teaspoon sized rounds of the filling into the bottom of each cup. I like to roll teaspoon sized balls in the palm of my hand and then flatten slightly to make flat round disks that fit inside the paper liners. Add more chocolate to your plastic bag and then top the filling with an additional teaspoon of chocolate. Use your paint brush to smooth out the chocolate and cover the filling completely, and then gently rap your pan on the counter to smooth and settle all three layers of the candy. 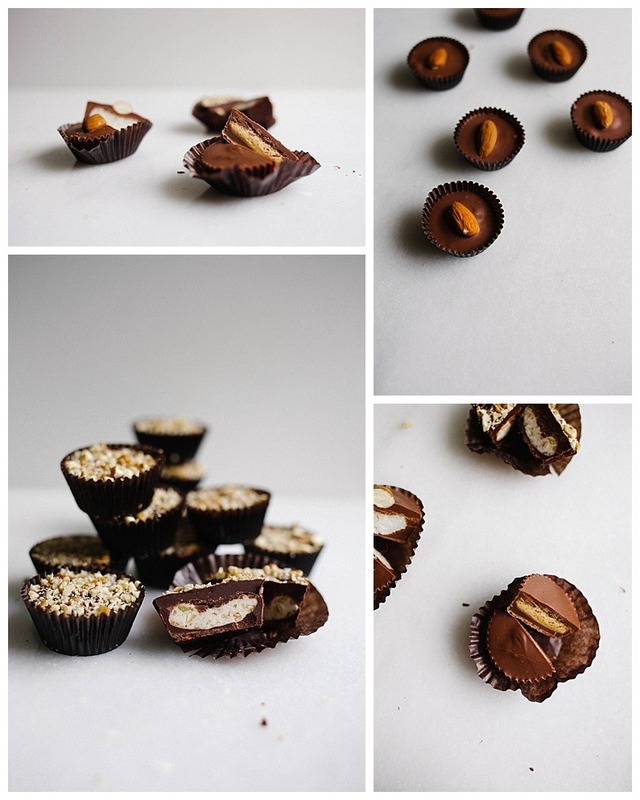 Place a single toasted almond on top of each candy. Allow them to rest in the mini muffin tin in the fridge or freezer for at least 30 minutes. Store candies in the fridge for up to two weeks. The candies may form a white film on the chocolate if stored at room temperature for extended periods of time. Hooray! thank you for sharing this! Which brand of chocolate do you use? oops. i think we might be talking about different jojo’s. i got one of those subscription snack boxes for a free trial. and they had a brazilian peanut candy that tasted exactly like the inside of a peanut butter cup. so good! will have to make homemade pb cups though 😍 also i found out that jojo released an album last year sooooo that’s been cycling through my ears. DID HE LEAVE KC!!?!?! WHAT IS HAPPENING IN THE WORLD? Sweet Heavens! You are great ! Thank you and have a pleasant week end ! Thank you! Same to you and happy baking!